On July 11, 1988, New York City gained its first and only roller coaster landmark. 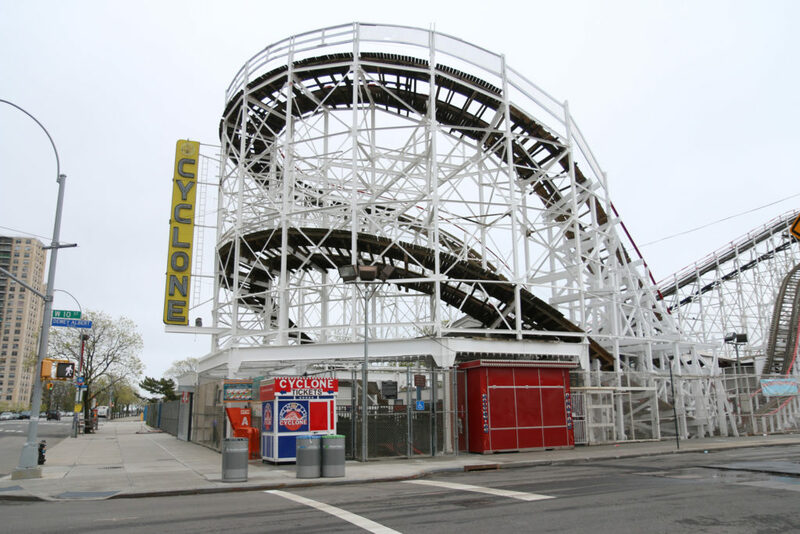 That roller coaster, of course, was the world-famous Coney Island Cyclone, a wooden coaster that first opened in 1927. The two — coaster and coastal amusement park — have been almost synonymous. The Coney Island Cyclone, which features an 85-foot drop and more than 2,600 feet of rickety track, almost closed in the early 1970s, but it survived. It was refurbished and re-opened in the mid-70s. 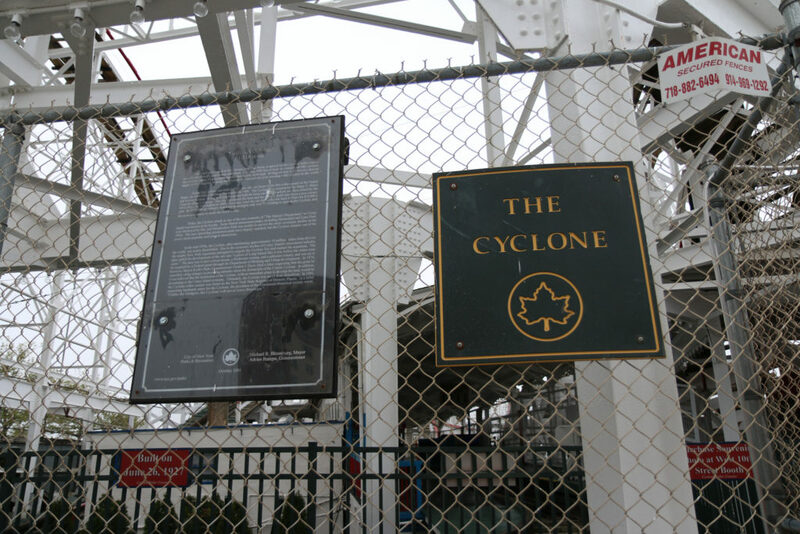 In 1988, the Cyclone was declared a New York City Landmark. Three years later, it joined the ranks of National Register of Historic Places. At the start of the summer season, every summer season for the last 40 years, one Brooklynite Eric Knapp, the self-proclaimed “Mr. Cyclone,” is the first in line to ride the coaster that holds a special place in his heart. “It’s like the first time every time, and I’ve actually ridden it over 2,000 times,” says Knapp, who last rode it on opening day on March 20, after spending the night outside to make sure he would get to be the first one to take a spin. The Cyclone isn’t the only landmark in Coney Island. The 150-foot-high Wonder Wheel became one in 1989 and the Parachute Jump, often dubbed the Eiffel Tower of Coney Island, landed the designation in 1977. The 1924 building that once housed Child’s Restaurant on the boardwalk is also a city landmark. But for Mr. Cyclone, there is no contest as to which one is best. Brooklynite Eric Knapp has a tattoo of the Cyclone on his right arm. 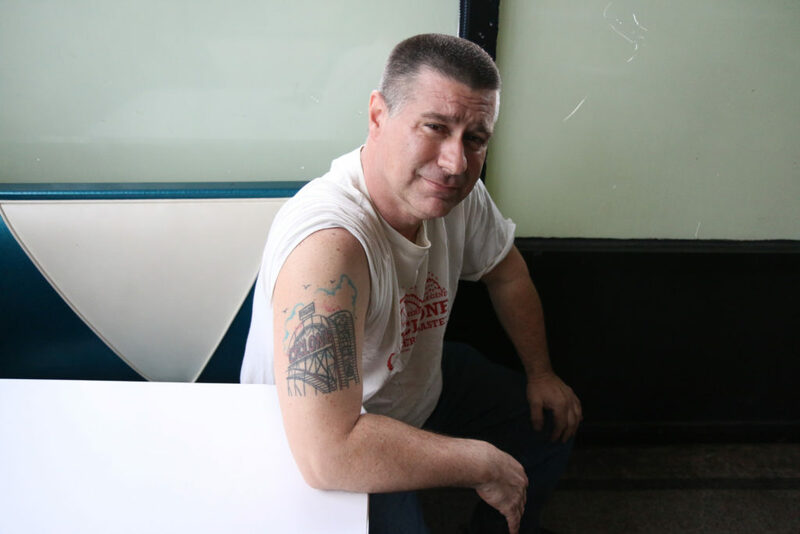 Knapp, aka Mr. Cyclone, who has a tattoo of the ride on his right arm, remembers his grandfather taking him to Coney Island after he retired. It was 1973, and Coney Island was Knapp’s “playground,” as he calls it. “I had the best life when it came to growing up [with] all the toys that were around us,” he said. His parents would never allow him to ride the roller coasters, but it didn’t stop him. He kept bugging his grandfather. Finally, when he was 7, his grandfather caved and they boarded the Thunderbolt, another roller coaster on the other side of the island. The Thunderbolt was torn down in 2000, but Knapp keeps it close. His left arm sports a Thunderbolt tattoo. Ultimately, Knapp dragged his grandfather to the Cyclone. The duo weren’t able to ride the third Coney Island roller coaster, the Tornado, because it fell victim to fires and vandalism. It came down in 1977. Given his mechanical expertise, Knapp respects park owner Zamperla’s upkeep of the landmark. Every winter since 2010 Zamperla has replaced a section of track, similar on a small scale to the way the MTA maintains the subway system. “I do give them a triple A for the maintenance and the refurbishment,” Knapp said, sitting in Freak Bar, a Coney Island watering hole. The new track has made the coaster even better. The Cyclone has a 85-foot drop and more than 2,600 feet of rails. Not that the fear ever stopped him from being the first to ride his favorite coaster every year. Five of his friends have caught the bug too. They join him, meeting him the night before the park opens, grabbing a bite and hanging out all night waiting for the coaster to open in the morning. Even after riding the Cyclone for over 40 years, for Mr. Cyclone, and now his buddies, the magic is still there.